"This is a powerful act of solidarity with all those hurt and lost in the war in Syria. we welcome the arch to New York City, where New Yorkers and visitors can see the historic work of art. together, we will demonstrate our collective resolve to protect our common heritage and humanity"
"In light of the rapid changes taking place in the region, the role of the next generation of technology becomes apparent in preserving the artifacts and heritage of the region from disappearance and destruction, so that they may remain as live witnesses for the next generations of the history of humanity's achievements over the centuries in the countries of the region and around the world." "We in New York have always been a city of inclusion and tolerance and welcoming people, and a city where we like to marry the old and the new. So what could be more appropriate than to have this symbol of freedom in front of City Hall?" "The documentation of cultural heritage in areas affected by conflict or natural disasters, including through the use of new digital technologies, is a critical step to preserve the memory of our past and mitigate the risk of possible damage or loss of precious cultural assets. Initiatives such as the Million Image Database project by the Institute for Digital Archaeology, which is based on the support of numerous volunteers on the ground, also testify to the importance attributed to their cultural heritage by local communities." "New York, you are ancient Egypt! But an Egypt turned inside out. For she erected pyramids of slavery, and you erect pyramids of democracy with the vertical organ-pipes of your skyscrapers all meeting at the point of infinity of liberty!" There are few cities in the world as much defined by their architecture as New York. The Empire State Building, the Statue of Liberty, the Brooklyn Bridge -- all symbols of the audacity, strength, technical prowess, diversity and optimism of what Ezra Pound called "the most beautiful city in the world." It is also a city that has known terrible loss -- first and foremost the loss of life, but also the loss of familiar landmarks that helped inform the city's identity. The Triumphal Arch, a symbol of resilience in the face of loss, will be a fitting tribute to America's great metropolis. The arch will stand in City Hall Park, surrounded by buildings adorned with classical features suggesting the common cultural roots of East and West. We hope that you will visit us this fall to consider the relationship between people and the places they inhabit. "Boris Johnson, Mayor of London, recently said in connection with our reconstruction in Trafalgar Square of Palmyra’s Triumphal Arch that archaeologists have a duty to help rebuild the lost monuments of the Middle East. I agree wholeheartedly with the Mayor – but would go even further. Anyone who appreciates the art and architecture that beautifies the great cities of Europe and North America, who appreciates the science and technology that improves our lives or who enjoys the freedoms of representative democracy has a duty to help restore these lost sites. For in them lies the story of a region in which our collective artistic, scientific and political traditions were born. These monuments represent the shared history of humanity and stand for a rich and complex past that unites all people. By rebuilding these structures, we rebuild not only our own national histories, but our connections to each other, as well." On April 19, 2016, the IDA’s 26,000 lb monumental-scale marble reconstruction of the Triumphal Arch was erected on Trafalgar Square and opened to the public in a ceremony led by the then Mayor of London, Boris Johnson. The public reception was overwhelming with many tens of thousands of people making the trip to visit it. On September 19, 2016, after two weeks at sea, it was unveiled for a second time by Deputy Mayor Alicia Glen, H.E. 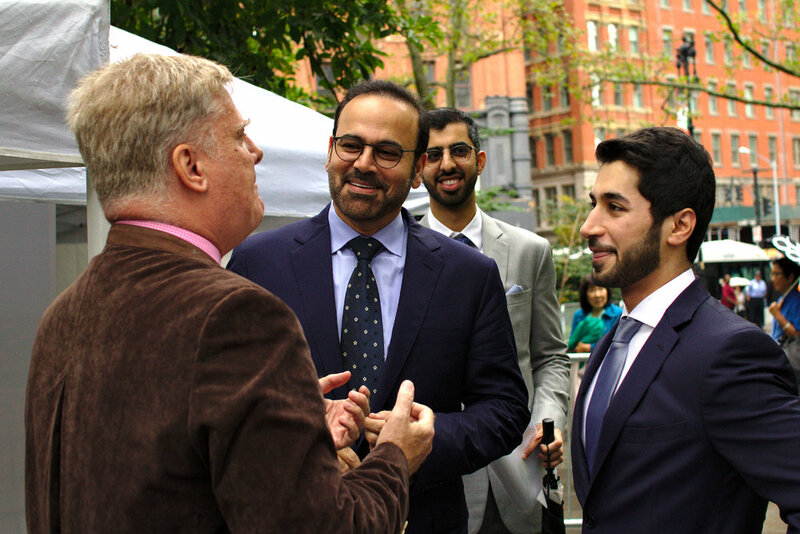 Mohammed Al Gergawi, and IDA Director Roger Michel on City Hall Park, New York City. Centered around Palmyra’s ancient triumphal arch, this exhibition represents the launch of a bigger project in collaboration with the UK’s Royal National Institute for the Blind, the USA’s National Federation of the Blind, and the New York public Library to develop and deploy 3D printing technology to help to make architectural cultural heritage — something which is traditionally very hard for those with sight difficulties to experience — more accessible. We aim, also, to draw attention to the extent to which emerging technologies have the power to transform the museum and gallery experience into one which is more welcoming, inclusive, and inspiring for those who cannot see. A total of seven tactile exhibits complete with braille, large print, and audio exhibition guide will explore the key architectural and decorative features of this ancient structure. The exhibition will travel across the United States in parallel with a sister exhibition in the United Kingdom. Chancey Fleet is the Assistive Technology Coordinator at NYPL's Andrew Heiskell Braille & Talking Book Library. This branch, located in Flatiron and serving patrons of all abilities, provides one-on-one Information literacy coaching and community workshops that educate assistive technology users, as well as developers and designers, about what's possible with accessible technology. From braille and talking books to programs that support tech novices, power users, creators and lifelong learners, visit talkingbooks.nypl.org to connect with a library of possibilities. Alexy Karenowska is a magnetician with a research group based in the University of Oxford, UK's Department of Physics, and is also Fellow by Special Election of Magdalen College Oxford. A trained engineer as well as a physicist, Karenowska directs the IDA's technical team. She has a particular interest in the application of 3D printing and machining technologies to the restoration or replication of damaged or destroyed archaeological structures and artefacts, and the development of new technologies for the characterization and the development of new technologies for the characterization, preservation and appreciation of heritage objects. Rebecca McGinnis is the Senior Managing Educator for Accessibility at The Metropolitan Museum of Art. She and her colleagues are internationally recognized for their innovative programs for people with disabilities. In 2013 she developed and co-taught Museums, Accessibility, and Technology, a semester-long course in the MFA in Design + Technology program at Parsons the New School for Design, with Don Undeen, then manager of The Met’s MediaLab and professor Katherine Moriwaki from Parsons. She isan adjunct lecturer in the Museum Studies Program at Johns Hopkins University, where she teaches Accessibility in the Museum. In 2014 the Met received the American Foundation for the Blind’s Access Award. In 2011 Rebecca received the LEAD Award for Excellence in Accessibility Leadership and the American Council of the Blind Achievement Award in Audio Description for Museums. Her publications include “Islands of Stimulation: Perspectives on the Museum Experience, Present and Future” in The Multisensory Museum: Cross-Disciplinary Perspectives on Touch, Sound, Smell, Memory, and Space, ed. Nina Levent and Alvaro Pascual Leone, Rowman & Littlefield, 2014. She has MAs in Art History and Museum Studies and pursues a PhD in Cognitive Psychology at Teachers College, Columbia University. Steve Landau founded Touch Graphics in 1998. The company has received numerous federal RD grants, and produces interactive tactile signs, exhibits, and learning aids, based on the outcomes of government-funded research. These materials communicate spatial concepts through touch, vision and hearing. Recent projects include a network of 40 universal talking tactile maps for Google's NYC headquarters; interactive talking sculptures of a seahorse and penguin for Chicago's Shedd Aquarium, tactile painting panels for the National Gallery of Art, and a touch-responsive campus model for Overbrook School for the Blind. Steve studied art at Oberlin and design at Harvard. Emilie Louise Gossiaux is an artist born and raised in New Orleans, and currently living in New York City. She began her undergraduate studies in the arts at the Cooper Union in 2007. Just before her Senior year, in 2010 she lost her vision due to a traumatic accident. After regaining her strength and independence, Gossiaux returned to the Cooper Union in 2013, and graduated with a BFA in 2014, with an award of excellence in sculpture. Upon graduating, Gossiaux began her year-long internship at the Metropolitan Museum of Art with the Media Lab, and Access/Community programs. After completing her internship, she was hired as a Contractual Museum Educator, and is currently teaching blind and visually impaired visitors in the Seeing Through Drawing class, and has led several gallery talks for general audiences in Adult programs, exploring cross-sensory methods for experiencing art. As a practicing artist, Gossiaux has shown her sculptures and paintings in several art galleries and institutions around the world, including Pippy Houldsworth Gallery in London, Storefront Lab in San Francisco, Cantor Fine Arts Gallery in Los Angeles, 5 Press Gallery in New Orleans, Recess Gallery in New York City, and the Smithsonian Institute of Art in Washington D.C. In 2013, Gossiaux won an award of excellence from the VSA IN/FINITE EARTH Kennedy Center for the Performing Arts, and in 2014, she graduated from the Cooper Union with an Elliot Lash Memorial Prize for excellence in sculpture. 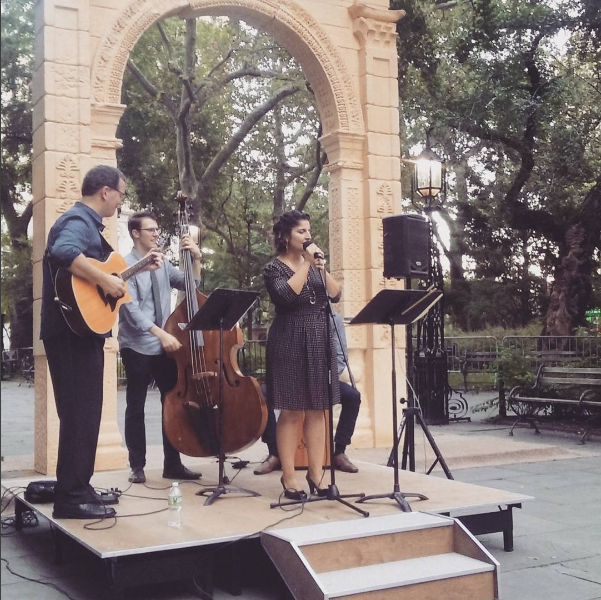 The Triumphal Arch, City Hall Park, 6 pm, Thursday September 22. On Monday September 19th, we celebrated our official unveiling ceremony with leaders from NYC and around the world as well as cultural luminaries from New York's theater and arts communities. This Thursday, join us for an evening of interpretive reflections on the eternalism of memory and the power of new technologies in the preservation, restoration, and celebration of history. Conversations will encompass the history of the Triumphal Arch, the science underpinning the installation, and the use of new technologies to broaden access and enliven the world of cultural heritage with special reference to our current tactile exhibition at the New York Public Library’s Andrew Heiskell Braille and Talking Book Library. To Feature an acoustic tribute to the 35th anniversary of another memorable event in the history of New York’s great public Parks: Simon and Garfunkel's legendary Concert in the Park, September 19 1981. Open and free to all. Among the major turning points of the Syrian conflict, few have been laden with as much symbolism—or geopolitical posturing—as the recapture of the ancient city of Palmyra on March 27, 2016. After a weeks-long campaign by Russian bombers and Syrian regime soldiers, the withdrawal of ISIS forces from this extraordinary desert oasis was celebrated as bringing an end to an infamous reign of barbarism. "Specifically, in conjunction with UNESCO, engineering specialists at Oxford University and Harvard University, the IDA captures millions of 3D images of threatened objects throughout the world through volunteers armed with 3D cameras, specifically within conflict zones, captured by ordinary people living in these zones who are passionate about preserving structures and architecture." "We hope to signal the potential for triumph of human ingenuity over violence and celebrate images from the past that unite the cultures they represent," said Roger Michel, the IDA's executive director. "We also hope that visitors to the installations will consider the role of physical objects in defining their history and weigh carefully the question of where precisely history and heritage reside." In a statement on the occasion, Al Gergawi said that the project is a message from the UAE to the world that the region’s history is bigger than any ideology or extremists that are attempting to destroy the identity and history of the region. “The UAE’s global message is that our objective is to preserve human civilisation and ensure that it transferred to future generations. This complements the vision of His Highness Shaikh Mohammad Bin Rashid Al Maktoum, Vice-President and Prime Minister of the UAE and Ruler of Dubai, to preserve heritage, because it is a source of inspiration for innovators, encouraging them to develop it further and build on it to meet future requirements,” said Al Gergawi. The reconstruction is meant to "to provide an optimistic and constructive response to a destructive threat to history and heritage," said Roger Michel, the IDA's executive director. "No one should one should consider for one second giving terrorists the power to delete such objects from our collective cultural record. When history is erased in this fashion, it must be promptly and, of course, thoughtfully restored." IDA’s final goal is to bring the arch back to Palmyra, where the original was destroyed in the summer of 2015. (Palmyra was recaptured by the Syrian government in March.) In New York, visitors will be able to walk underneath the replica and touch it. One person at the unveiling ceremony said she came all the way from Los Angeles to see the arch. "I think it's great to remind us that ISIS can't destroy an idea or a culture," she said. "They can't say, 'we destroyed a symbol' and get away with it." Why then put up the arch at all? It was originally created by the UK-based Institute for Digital Archaeology and unveiled in London's Trafalgar Square, where it was celebrated by then London Mayor Boris Johnson as an action representing 'technology and determination'." You can check out the arch this week, before it moves on to Dubai at the end of the United Nations General Assembly. The 11-tonne arch was placed in the small park directly outside of New York’s city hall, in the heart of the financial district. The park is usually occupied by tourists visiting city hall and the nearby World Trade Center memorial and office workers on their lunch breaks. The arch is not roped off, allowing visitors to walk under it and touch it. The unveiling of the replica comes just two days after home-made bombs went off in Manhattan and New Jersey over the weekend, injuring 29 people. Glen said that the timing and location of the arch's unveiling is also significant "particularly on a day like today, where acts of vandalism and terrorism are so much on all of our minds". “Syria’s future depends on the conservation and protection of Syria’s past,” ...The replica arch was built as part of a project by the Institute for Digital Archaeology, a joint initiative that works with Oxford, Harvard and the Museum of the Future in Dubai, the United Arab Emirates, to draw attention to the destruction of cultural artifacts across the world, and to rebuild some pieces. "Cultural heritage and historical evidence of the region's noble civilizations enjoy a special place in peoples' mind and spirit, and have a scientific and epistemological importance as they represent key elements required to identify the societies' identify and features", Al Gergawi stated. Culture writer Charlotte Higgins explores the UN's peacekeeping agency, established 70 years ago to build peace through education, science and culture. Its founders knew that a safer world could not be engineered through economics or politics alone. With optimism and purpose, they called on countries to pull together to inspire hearts and minds. IDA Director Roger Michel said the reconstruction of violently destroyed treasures serves a crucially important social value. "Monuments, as embodiments of history, religion, art and science, are significant and complex repositories of cultural narratives," he explained. "No one should consider for one second giving terrorists the power to delete such objects from our collective cultural record." A piece of history recently reduced to rubble by ISIS’ bombs in Syria will be resurrected thanks to advanced 3-D imaging in New York’s City Hall Park on September 19. The U.K.’s Institute for Digital Archaeology, a group of scientists from Oxford and Harvard and Dubai’s Museum of the Future, have recreated the ancient Syrian city of Palmyra’s recently destroyed Triumphal Arch in marble using photographs of the site taken by high tech 3-D cameras. Move over Temple of Dendur: You'll soon have competition for status of most selfie-ready, ancient ruin in New York. On September 19th, the Institute for Digital Archaeology will be bringing a full-scale replica of Arch of Palmyra to Gotham at a yet-to-be announced location. “Anything that can bring awareness and bring people together, that honors our past and looks towards the future — I think that’s a good thing,” he said. “I think if it sparks a discussion, that’s a step in the right direction.” The discussion the arch has largelysparked, however, is whether the replica is really executed in good taste and what message it conveys, if any. The arch installation in City Hall Park is possible through the cooperation of The Mayor's Office of Citywide Event Coordination and Management. Stay tuned for more coverage from the unveiling today!